Twelve Allen M. Sumner-class destroyers—six ships from Bath Iron Works (DD 735–740) and three each from Bethlehem, Staten Island (DD 749–51) and Bethlehem, San Pedro (DD 771–773) were converted during construction as fast minelayers (DM 23–34)—the Robert H. Smith class. 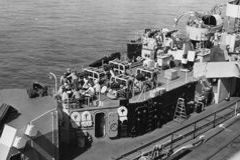 Above: mines on mine tracks, USS Robert H. Smith. Below: fantail, USS Gwin. Bottom: depth charge projectors, USS Gwin. These ships were fitted with tracks running fore and aft on both sides of the weather deck (right). 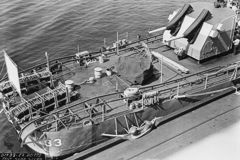 Each track had room for 60 mines, which could be released in quick succession over the stern. To accommodate them, depth charge racks on the fantail were moved inboard and no 20mm mounts were installed there. 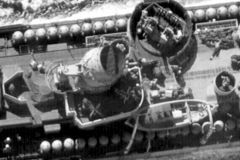 Also, the tracks left no room for “K”-gun depth charge projectors, so these were moved atop the after superstructure (lower right), replacing the torpedo tube mount there. The forward torpedo tubes were also deleted. Photos taken early in these ships’ careers show mines on board but the DMs never were called upon to lay mines, They did, however, participate in minesweeping operations at the close of the war, and otherwise operated interchangeably with unconverted destroyers. Organized as Mine Squadron 3, they accumulated a distinguished record on radar picket stations off Okinawa. The Presidential Unit Citation was awarded to Harry F. Bauer, Henry A. Wiley and Aaron Ward, while the Navy Unit Commendation was received by Robert H. Smith, Adams, Shea, J. William Ditter and Gwin—a total of eight of the twelve ships in the class. At Okinawa, both J. William Ditter and Aaron Ward were so badly damaged during suicide plane attacks that, after steaming home under their own power, they were decommissioned 28 September 1945 and scrapped in July 1946. Others were stricken in 1970–71 except Shea, which lasted until 1973. All were scrapped except Gwin, which was sold to Turkey in 1971, where she served as Mauvenet.